Facts And History Of Mardi Gras Festival - What is Mardi Gras? What does Mardi Gras means? The celebration of Mardi Gras—also known as Fat Tuesday or Pancake Day, depending on where you are—dates back to Medieval times in Europe. Feasting on the days leading up to Ash Wednesday, which begins the Lenten season of fasting, to be exact, the annual Carnival always kicks off 12 days after Christmas (January 6th) and continues until Fat Tuesday (the evening before Ash Wednesday.) It’s a period filled with celebrations, parades, balls, and parties, all of which culminate on Tuesday, February 13. It’s basically all about ritualistic eating of generally unhealthy foods before forty days of fasting that accompany the season of Lent in the Catholic faith. According to Olivia Waxman, “Though the Mardi Gras festivals in New Orleans originated in this Christian tradition, today the celebration is better known as a day for people of all faiths, races, and ethnicities to come together at the parades, eat great food, and compete to catch beads, doubloons and other throws from the people wearing masks on the floats parading down the streets. Note: Just so that it‘s clear, most people get confuse between Mardi Gras Parade and Mardi Gras Carnival. Well the answer is here, base on the research conducted by Jesse Greenspan Mardi Gras Parade and Carnival are the same celebration. Though Mardi Gras technically refers only to Fat Tuesday, the Mardi Gras season actually begins on Epiphany, a Christian holiday celebrated on January 6 that is otherwise known as Three Kings Day or the Twelfth Day of Christmas. In Brazil and many other countries, this period between Epiphany and Fat Tuesday is known as Carnival. Whichever name you prefer to use, the revelries of Mardi Gras last until midnight tonight, when Ash Wednesday ushers in 40 days of Lent. How did mardi gras start and where did mardi gras originate? All of this started when Pierre Le Moyne d’Iberville a French-Canadian explorer arrived in Mobile, Alabama on a Fat Tuesday of the year 1699. Upon his arrival he called the place “Pointe du Mardi Gras,” since essentially by definition Mardi Gras means Fat Tuesday and then he threw a little party. As years have passed, French travelers would come and visit the same spot to celebrate Fat Tuesday, explicitly for that reason only. And so to this day, Mobile, Alabama claims to hold the oldest Mardi Gras celebrations in the country. A few years after that, according to a research done by, Leah Silverman, In the year 1704, Mobile established a secret society (Masque de la Mobile), similar to those that form our current Mardi Gras krewes. It lasted until 1709. In 1710, the “Boeuf Gras Society” was formed and paraded from 1711 through 1861. The procession was held with a huge bull’s head pushed along on wheels by 16 men. Later, Rex would parade with an actual bull, draped in white and signaling the coming Lenten meat fast. This occurred on Fat Tuesday. What is a Mardi Gras Krewe? There is so much to Mardi Gras history and facts yet to be told. It wasn’t all fn before. There were years of massive suppression. According to Holly Hartman and Chris Frantz Mardi Gras became the celebration we know today because of a secret society. Since its first impromptu celebrations in the early 1700’s, Mardi Gras had been regularly cancelled or banned for its destructive drunken parties, and it was only round the year 1740s when a standard Mardi Gras ball have been established and so essentially it was a celebration that has a reputation of being frowned upon. In fact the event was recognized but not highly encouraged -that is until 1837, when a secret society known as the Mistik Krewe of Comus aimed to elevate the chaotic experience, replacing the debauchery with lavish balls and parades. Eventually, the “Fat Tuesday” celebrations of New Orleans garnered much support and enthusiasm, later establishing itself as the Mardi Gras capital of the country. Moreover, There are more than 70 secret societies (or “Krewes”) involved in today’s Mardi Gras festivals. Each Krewe builds a float to represent their specific theme on parade days, and features a celebrity guest to regal their audience. One of the more unusual groups is the Krewe of Chewbacchus—a society that combines the lovable Star Wars Character with the Greek God of wine. What is the history behind Mardi Gras ball? Historically speaking, Mardi Gras may have originated at Mobile, Alabama but throughout the world, however, New Orleans, Lousiana is widely known for celebrating the event as it grows bigger and bigger each passing year. But you see, looking back, it wasn’t grand before as it is now. “By the 1730s, Mardi Gras was celebrated openly in New Orleans, but not with the type of balls we know today, In the early 1740s, Louisiana’s governor, the Marquis de Vaudreuil, established elegant society balls, which became the model for the New Orleans Mardi Gras balls of today,” Leah Silverman added. That was how Mardi Gras ball have come to pass. Now let’s talk about Mardi Gras Parade. What is the history behind Mardi Gras Parade? And so after decades of suppression, the first official Mardi Gras parade took place in 1837. Parades and elegant balls continued in the following years, but by the early 1850s, had begun to wane in popularity. At dawn on that most famous Tuesday, most people, hence watchers, hence fun-seekers have claimed the best spots on the streets to watch fabulous float parades, outrageous street performers, and possibly celebrities that have come to visit and participate in the celebrate. According to Holly Hartman and Chris Frantz, it was the year 1872 when a group of businessmen invented a King of Carnival, Rex, to preside over the first daytime parade. 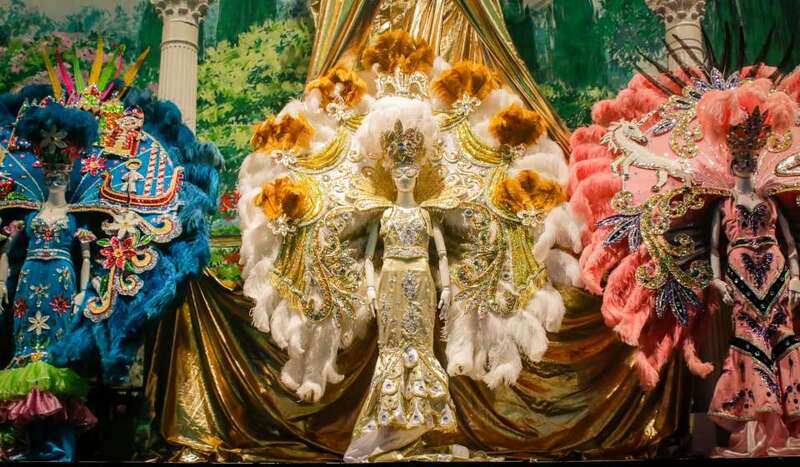 To honor the visiting Russian Grand Duke Alexis Romanoff, the businessmen introduced Romanoff’s family colors of purple, green and gold as Carnival’s official colors. What are the mardi gras colors and its meaning? For the sake of elaboration, When asked why purple, green and gold? According to Leah Silverman, It is rumored that when Grand Duke Alexis visited in 1872, his welcoming committee handed out purple, green, and gold beads to the party-goers that year, as they were the colors of his home. The trio of shades came to symbolize the festivities and was later given meanings: purple for justice, gold for power, and green for faith. This was also the Mardi Gras season that Carnival’s improbable anthem, “If Ever I Cease to Love,” was cemented, due in part to the Duke’s fondness for the tune. Mardi Gras Masks and Costumes? You can wear a seemingly wide variety of outfits during a Mardi Gras celebration. Dress as a French royalty, Bunnies, feather-covered showgirls, painted clowns, masked lions even scary looking ones. Crazy costumes and wild make-up, representing art and meaning are publicly displayed all over the scene. On a grand scale, with masked balls and colorful parades going on the whole event —your imagination is the limit. Masks and costumes have been associated with Fat Tuesday celebrations for centuries. And even today of the masks commonly seen in New Orleans on Mardi Gras are the same types popularized by the two-to-three-week-long Carnival in Venice that culminates with Fat Tuesday. But masking and costume-wearing in New Orleans also has a specifically American history, as it was another way for revelers who were officially excluded from the festivities to join in, by concealing their identities. How about Mardi Gras Music? Music takes a huge part of the event as it keeps the parade and streets lively. The grand opening starts with a wide spread jazz music throughout the city as the marching bands including floats that sometimes take a total of 350 large ones and costumed parade participants take over the scene. What are the Mardi Gras traditions? According to Olivia B. Waxman King Cake is only eaten during Mardi Gras. Available only during the Mardi Gras season, king cake is typically made with brioche dough. Braided and laced with cinnamon, the dough is then glazed with purple, green and gold sugar or covered in icing in those same Mardi Gras colors. What really sets king cake apart from other desserts, however, is the small plastic baby hidden inside. Whoever finds the baby in his or her slice must buy the next cake or perhaps host the next party. Presently, the round cake, which nowadays comes decked out in green, gold and purple icing, dates back to the Middle Ages when European Christians feasted before the Lenten fasting season. It is illegal to wear masks in New Orleans except on Mardi Gras. Bear in mind, when visiting New Orleans that while it is almost customary to wear a mask during Mardi Gras celebration to fully embrace in the party-spirit, it is illegal to do so when the event is over. When the Mardi Gras Parade, Mardi Gras Masquerade Ball and Street Party of the festivity has come to end -Mardi Gras masks must be removed by 6:00 p.m. There has been a city ordinance at New Orleans restricting people to wear masks on any other day. Each Krewe hurls party favors into the crowds. Floats notoriously give out “throws,” which are exactly what they sound like: objects thrown into the crowd. They range from coconuts (given by the Krewe of Zulu) to stuffed animals or gold doubloons (by the Krewe of Rex). Beads are the most ubiquitous throws, which are given by almost everyone. It’s considered a great honor to receive a throw. What are the Mardi Gras Decorations? The throwing of beads and fake jewels, from parade floats to those watching down below, is thought to have started in the late 19th century, when a carnival king threw fake strands of gems and rings to his “loyal subjects” sometime in the 1890s. By the early 1920s, one of the Krewes, probably Rex, started regularly throwing strands of glass Czech beads, a precursor to the plastic beads seen today.10. The throwing of beads and fake jewels, from parade floats to those watching down below, is thought to have started in the late 19th century, when a carnival king threw fake strands of gems and rings to his “loyal subjects” sometime in the 1890s. By the early 1920s, one of the Krewes, probably Rex, started regularly throwing strands of glass Czech beads, a precursor to the plastic beads seen today. According to Holly Hartman and Chris Frantz The millions of colorful beaded necklaces thrown from floats are the most visible symbols and souvenirs of Mardi Gras. In addition, millions of cups and toy coins known as “doubloons” are decorated with krewe logos and thrown to parade-watchers. Some “throws” are especially prized: only the luckiest folks manage to take home the hand-decorated coconuts from the Krewe of Zulu. People do outrageous things to catch the most throws. Some dress as priests, hoping the many Catholics on the floats will shower them with goodies. Others dress their children in eye-catching costumes and seat them, holding baskets to catch the loot, on ladders that tower over the crowds. Others give up on the costume ploy altogether, finding that taking clothes off can be the quickest attention-getter.